I'm a little conflicted this week guys. I think... 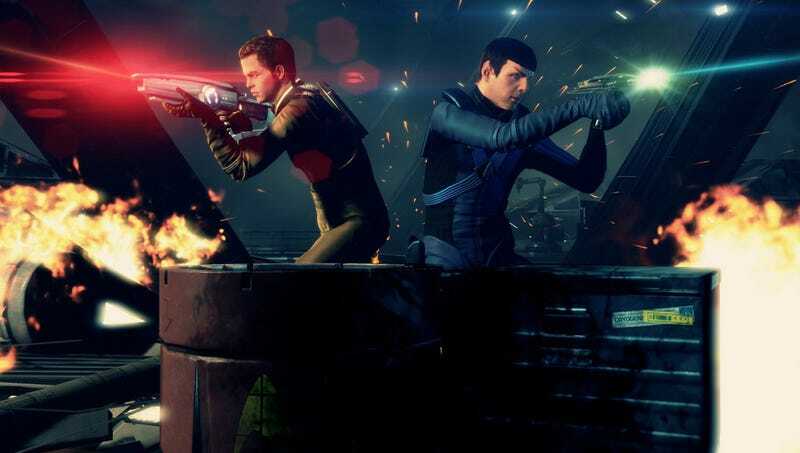 I think I kinda like the look of the new Star Trek movie game that's out today. I mean, sure, it doesn't look like a AAA, GOTY-contender sort of game, but it looks neat. That aside, there's plenty other video games to talk about in this week's Tuesday Game Room! What have you been playing this week? I've only got Nylenna here up to like, Level 16 so far, but... little has been done to SWTOR since I left it for better pastures. In fact, I feel like the move to Free 2 Play has made the game even more frustrating (why yes, I would like to pay for UI features that were previously built into the game as standard! That sounds like fun ways to integrate F2P content! More restrictions please!)... yet. Yet. I still get that joyous smile when my smuggler rolls into cover, the Star Wars music kicks into first gear, and there's that undeniable pew pew of Blaster fire ringing out. Or when my sultry Twi'lek voice is crackin' wise, that Solo-esque rogue with a heart of gold. Or when I recuperate health by flicking a credit chit into the air, acing it with a quickdraw blaster shot, before twirling my pistol around and reholstering. It's not the best MMO, but god dammit, it's a Star Wars MMO, and that will always stir something within my heart. Seems like it's week of the expansion as both Dragon's Dogma: Dark Arisen and Dead Island: Riptide make their debuts, although it's odd to see one release at a good 'expansion price', and the other at practically a standard retail, despite both being considered as mere 'expansions' rather than full sequels - Dragon's Dogma is cheaper AND comes with the original (and pretty awesome) game though, which is nice. Also out this week on XBLA and PC is Monaco: What's Yours Is Mine, a co-op heist game with an interesting, semi-retro artstyle, and winner of the Grand Prize at the 2010 Independent Games Festival. Anyone picking up something new this week, or dipping back into your backlog? Ratchet and Clank are getting a movie in 2015 - Hey, this is actually a neat idea! And could be one of the best video game movies out there (that's not hard to do, I suppose)... Ratchet and Clank as an IP suits itself to a big, CGI animated romp on the silver screen. Looking forward to this! Digital Foundry looks at ways to 'Future-Proof' your PC for the next generation - Are you a predominantly PC gamer who's looking to update your PC in time for the console's generational leap? Or perhaps you're tired of consoles after the 360 and PS3, and want to get in on PC gaming by the time their next iterations come out? Digital Foundry offer a guide to beefing up your PC above and beyond what the next generation can handle. Tim Langdell's Trademark Trolling is finally over - Man, this story has been going on for a while. But finally, the despicable Langdell, who's been attempting to squeeze indie developers, gaming mags and even EA over his supposed ownership over the word 'Edge', is done for as a Californian judge strips him of his trademark. Team Bondi, the team behind L.A Noire, face layoffs as development of Whore of the Orient gets put on hold - man, everything was looking pretty bright for the aussie developers of a critical darling like L.A Noire, but between reports of serious office mismanagement, and now this, it seems like nothing can go right for them. A shame, because L.A Noire was a pretty fantastic game. NINTENDO ARE MAKING A LINK TO THE PAST SEQUEL FOR 3DS - This extra tidbit's mainly for me, but still... NINTENDO ARE MAKING A LINK TO THE PAST SEQUEL FOR 3DS! Brb, dying. BREAKING NEWS EDIT: Microsoft and Pizza Hut combine to launch a Kinect-based Pizza delivery app for 360 - It's like Everquest's /pizza, only 8 years later! Make your pizza through the magic of Kinect, then let it be delivered to your door! Just... oh god, I'm so embarrassed to be invested in the Xbox platform right now you guys. We'll be back this time next Tuesday for more gaming discussion, but for now, sound off in the comments with the games you've been playing, and what you're looking forward to this week!